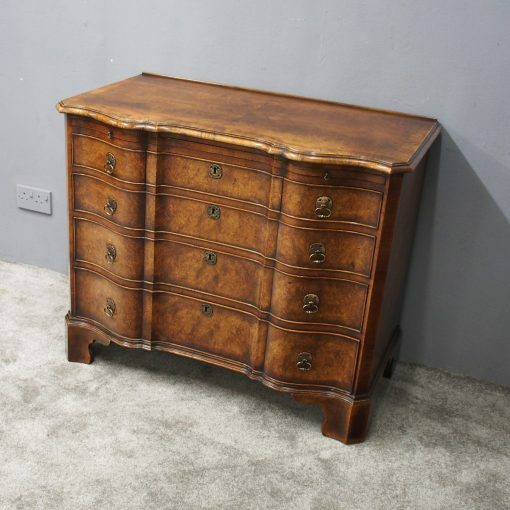 Circa 1910, George II style figured walnut, serpentine front chest of drawers. 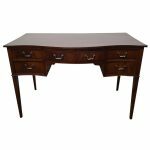 The quarter veneered and cross banded top with a moulded fore-edge is in figured walnut with a honey colour. It has a brushing slide with axe head handles, which is over 3 short and 3 long graduated cross banded drawers with cast brass drop handles and escutcheons. Finishing on a moulded base and shaped bracket feet.